Q. 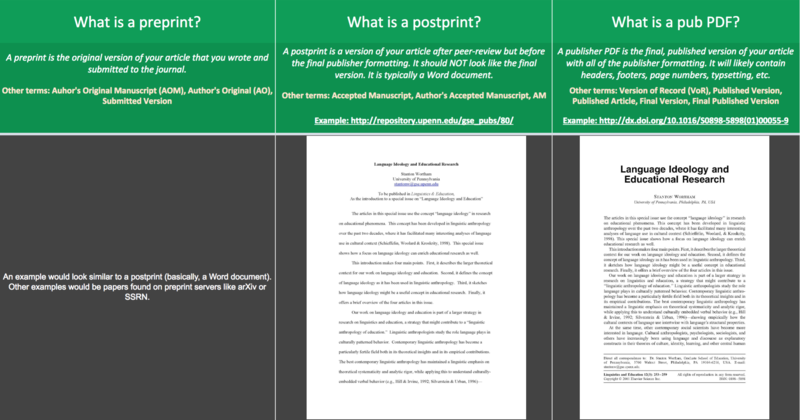 What are the differences between the various versions of a scholarly article? Whether or not you are allowed to submit one or more of these versions to an institutional repository like ScholarlyCommons depends on your publisher's policies. The ScholarlyCommons team offers a faculty assisted submission process which provides a detailed rundown of permissions for your entire CV (faculty only). To learn more about this and other offerings, visit our services page. To view larger image, right-click and select "Open Image in New Tab."